There is no denying the fact that tourist destinations like Shimla and Manali have started to get way too crowded these days. These towns are still scenic but have gotten so populated off-late that a visit here don’t even feel like a vacation anymore. It just feels like you went from one city to another; due to which, a lot of people now venture towards locations that were once unknown and rarely visited by any tourists. One such place that I want to talk about in this article is the beautiful Sangla Valley; a place hidden in remote hills of Himachal, way too scenic and never crowded. In short, perfect for someone who wants to visit an off-beat destination where they could spend some in peace and away from the crowd. For a brief introduction, Sangla Valley, also known as Baspa Valley, is a river valley located in Kinnaur district of Himachal Pradesh. Is is named after the Baspa River that flows right through it. Sangla is the largest town here after which, the valley is also referred to as Sangla Valley. Other villages here include Chitkul, Karcham, Batseri and Kamru. Sangla is the largest town in the valley and has a petrol pump, Bank ATMs, Post Office, Restaurants, Bar, mid-range hotels and several shops selling all day to day commodities. The valley is surrounded by forested slopes, and is rich in apple orchards, apricot, Wall-nut, Cedar trees, and glacial streams with trout fish. Apple farming is one of the main livelihood of the people here; and this region boasts of growing the world’s best quality apples. In order to reach Sangla Valley, you will first have to get to Shimla and then drive there via Rampur. The valley starts from Karcham and ends at the small village of Chitkul. The area after Chitkul is under control of ITBP; and Tibet border is about 80 to 90 kilometers from here. Due to its strategic location, outsiders were not allowed to enter the valley until 1989 without obtaining a special permission. That rule was later removed and now tourists are free to drive all the way till Chitkul. A road bifurcates from Shimla Kaza highway at Karcham; and then travels for 40 kilometers through Sangla valley to Chitkul. In recent years, tourism in Sangla valley has been on increase. This entire area offers magnificent views of the high mountains around. With a river flowing right through it, this valley remains lush green throughout the year. During summer, its location in the greater Himalayan range gives it a milder climate than the plains. In peak winter though, it receives high amount of snow and gets cut off from rest of the Himachal for a few months. 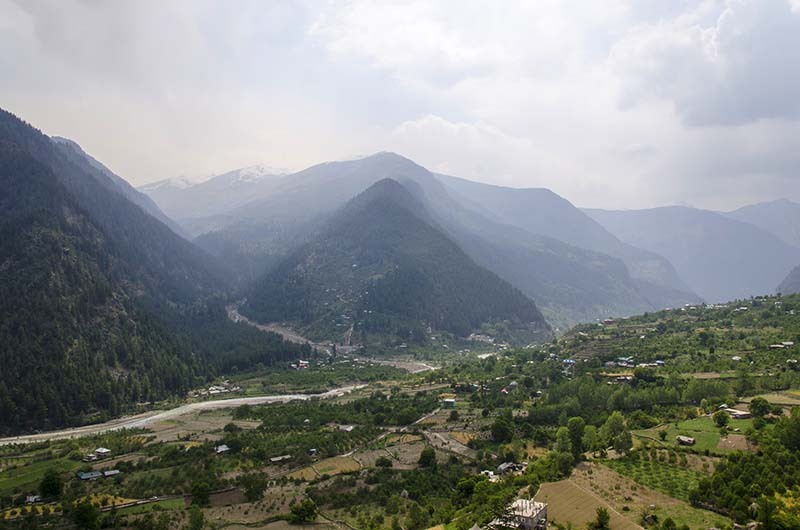 If you have been thinking about planning a trip to Sangla valley; then in this article I will provide details on how you can do so. Usually, a trip to Sangla and nearby Chitkul is part of an itinerary for Spiti valley. As a matter of fact, majority of the tourists you will find here will be traveling on the entire Spiti circuit; starting form Shimla and ending at Manali or the other way around. But if you were short on time or just wanted to visit Sangla and the nearby places, you could do that as well. First question that comes to mind is about how to get to Sangla. This entire area is in remote hills of Himachal Pradesh which means that the only way to reach here is by road. You can either get here from Shimla or Manali. The ideal and easier of these would be from Shimla. If you are into trekking then another way could be to trek and walk across the passes; but that would be information for a different article another time. For now, I will focus on how you can reach Sangla by road. The nearest airport to Sangla is the Shimla airport located in Jubbarhatti. After Shimla, the next nearest airport is the Bhuntar airport between Chandigarh and Manali. These are however small airports and flights to both these places are limited. The nearest major airport is at Chandigarh which is connected with several flights from all over the country. So in order to reach Sangla, you will first reach Chandigarh (or Shimla) by either road, train or flight. From Chandigarh, you will then climb up to Shimla and then continue uphill all the way till Narkanda. After Narkanda, the drive is mostly downhill to the banks of Sutlej River. You will then drive along with the river and reach Karcham while crossing Rampur and Jeori on the way. At Karcham, cross the dam over to the other side and turn on the road that goes towards Sangla. From Karcham, it is then a straight drive of about 20 kilometers to Sangla town. The same road then continues to Chitkul for another 20 kilometers and ends there. Route will be as mentioned below. Of these two routes, going via Shimla is of course the preferred way to reach Sangla Valley. If you started by 3 to 4 AM from Chandigarh, you can actually make it to Sangla and even Chitkul the same day. Whereas from Manali side, it will be at least a 3 day’s journey. You will first reach Manali on Day 1, then Kaza on Day 2 and Sangla on Day 3. Journey on all these 3 days will be way too long; and this route is not advised unless it is on purpose; and you want to cover Spiti valley as well. You can also reach Sangla easily by Bus. Shimla is very well connected by daily buses to almost every major city nearby. Once you reach Shimla, you have two choices. You can either board a direct bus to Reckong Peo or directly to Sangla. To explore the valley further, there are daily buses from Sangla and Reckong Peo to Chitkul as well. Another choice is of hiring a private cab from Shimla to Sangla but that will cost you at least Rs. 12,000 to Rs. 15,000. It can however be a good choice if you were traveling in a group of 5 – 6 people that can all share the cost. During summer, average temperature in Sangla valley remains to around fifteen degree Celsius. This however is just an estimate during a clear day with sun shining bright. Mercury here can dip anytime bringing the temperature down to around seven to eight degrees. Nights even in summer will be very cold and temperature will remain close to 5 degrees Celsius. Monsoon arrives in the month of July and remains until the end of August. The rains add freshness to the valley and enhance the beauty of the lush green vegetation. During this time, Sangla Valley turns into a sight to behold with green hills and flowers of numerous colors blossoming all around. At the same time, monsoon also brings the risk of landslides due to too much rain. Sometimes entire sections of the road can get washed away closing the valley for several days or weeks. If it rained non-stop then it will also force you to remain indoors at your hotel during your entire trip; giving little time for sightseeing and exploring. The months of winter, from November to February, witness plenty of snowfall. While the average temperature remains around 3 degrees Celsius, it can go as low as -10 degrees during peak winter. Usually in the months of January and February, it snows so much here that the road from Karcham to Sangla and Chitkul can get completely blocked. Your clothes will really depend on which month of the year you are visiting. A good quality heavy windproof is a must irrespective of the time you arrive here. During winter, you will need all your woolens as well as thermals. Gloves and warm socks too at this time will be must. During summer, your regular cottons accompanied with some light woolens will do the job. If planning a trip during monsoon, you want to bring clothes that will dry fast, like polyester. When you pack your jacket, ensure that it has a hood attached to it that can protect your head, ears and neck. The month of September in my opinion is the best time to visit Sangla Valley. This is the time when monsoon has just passed and the valley is at its full blossom. Weather will be pleasant with no risk of rain or snowfall. After September, Summer months in general are considered a good time to be visiting Sangla. You can go trekking or even camp with no worries of rain ruining your plans. January, February and August can be called as a bad time to be heading here. This is the time when the weather can turn extreme suddenly. Owing to heavy snowfall or rain, the roads can get closed leaving you stranded here. Even if the roads were open, the weather can still force you to remain indoors; trapping you in your hotel room with no chance of any outdoor activities or sightseeing. Karcham Dam; Bering Nag temple, dedicated to snake of Lord Shiva; Kamru village and the fort here which is over 800 years old; the Baspa Dam Reservoir; Sangla Buddhist temple, Lord Badri Nath Ji Temple , Mata Devi Temple and hike to Sangla Kanda are some of the places to visit and see in Sangla valley. There is also a saffron farm located on the outskirts of Sangla that you can visit. The biggest activity to do in Sangla is to enjoy the scenic beauty around you and relax. The peace and silence you will find here is like none other. Enjoy undisturbed walks while enjoying the flora and fauna of the valley If you are into trekking, then there are numerous trekking trails from Sangla to neighbouring valleys; like Jalandrigad valley via Lamkhaga pass , Har ki dun valley via Borasu pass , Sangla to Netwar via Rupin pass and Pabbar valley via Buran pass. Yamrang la pass & Gugairang La are the two passes situated on Indo-China border. Outdoor camping will be another great activity to do here. There are numerous camps on the banks of Baspa River that you can stay at. A few to name are as Banjara, Kinner, and the Sangla Valley camps; offering both tent and cottage accommodation. These camp sites can also organize various adventure activities like rappelling, rock climbing, river crossing for you. Even if you were staying at a hotel, you can also talk to any of the tour agents in Sangla and indulge in these activities. If you happen to be visiting in August and September, you can also attend the annual Fulaich Fair. It is a festival of flowers, celebrations of which involve traditional music and dances. You can also try your hand at fishing in Baspa river. There is also a trout farm here. It is like a huge aquarium where you can observe the beautiful trout floating in huge tubs. You can catch a daily bus from either Shimla or Reckong Peo to reach Sangla directly. Once you get here and to explore the valley further, there is a daily bus operated by HRTC that leaves from Sangla at around 12 PM, reaches Rakcham at 1 PM and Chitkul at around 1:30 PM. Apart from the HRTC Bus, there are a few other private buses as well that ply within Sangla valley and also towards Reckong Peo. A recent increase in tourism in Sangla valley has been observed and owing to this, new hotels have come up all across the valley. There are three types of accommodation choices available. The first one is of hotels and guest houses that are available in plenty at Sangla and Chitkul. You can easily get a hotel for Rs. 700 – 800 per day. There are HPPWD rest houses as well in the valley that you can try staying at. Second choice is of camp sites that are available at Sangla, Rakcham, Chitkul and at a few other scenic places en route. Third choice if of staying as a paying guest with the locals which is available at remote villages if you decide to venture in that direction. You can try some Tibetan dishes Noodles, Dumplings, Momos, Thukpa, etc. Apart from these, every north Indian dish is available at all the restaurants and hotels. Below are a few things that you can consider buying. Apples: The entire Kinnaur valley boasts of producing the best quality apples in the world. This will be the first item that you would want to buy from here and bring home. Kinnauri Shawls: Beautiful hand-woven shawls with colorful border. Kinnauri Cap: This cap, mostly green and grey, has overtime become a very symbol of Kinnaur and entire Himachal for that matter. Aside from being colorful and stylish, this cap is also very warm. Chulli(Wild Apricot)Oil: This oil is widely used all over Kinnaur, both for massage and as cooking medium. People here believe that this oil is what keeps Kinnauri people strong and healthy. Sangla is the largest town in the valley and has banking services and the only ATM available. I have been here a few times and have always found this ATM operational. There are several petrol pumps on the route as you approach Karcham from Shimla. In Sangla valley however, there is only one petrol pump just before Sangla town. I wouldn’t really worry much about fuel though because you will never really go a great distance without coming across a fuel station. Sangla Town is the only place where you can get some medical attention in the valley. That too however will only be for some minor ailments. If it was something serious, you would then have to rush to either Reckong Peo or Shimla. No matter which network you are on, your phones will work fine till Sangla town. After Sangla however, only BSNL has the connectivity and rest of the phones will be off the network. Even with BSNL, the reception around Chitkul and other villages is not that great. Connection will be intermittent and voice clarity bad. Data connectivity too will be good only until Sangla town and is slower than even 2G at rest of the villages. Sangla and Chitkul are usually part of itineraries for people visiting Spiti valley; but a trip to only Sangla valley is also a great idea. If you have a few days in hand then you can plan a trip here; explore Sangla and some other nearby places; and spend some time away in peace and tranquility. Below are a couple of itineraries that you can follow for the trip. For the sake of this article, I will assume that you are starting from Delhi and suggest accordingly. Above is a plan that lasts for an entire week and will have you spend plenty of time in the valley. If you have more days, then you can extend your stay at any of the places and head out on a few trails. If you were a bit short on time, then you can reduce your stay at Kalpa or Sarahan. A minimum of 5 days is what you will need to plan a trip here from Delhi. The road conditions are mostly all good until Karcham with a few bad sections in between. The 40 kilometers long stretch from Karcham to Sangla is a mix of good, bad and ugly but mostly average. I hope the information above on visiting Sangla was of help. If you need any further details, please feel free to ask in the comments section below; or at our Community Forum; and I will be glad to answer. How to roam around in sangla? If we don’t hire a cab…. is cycles available? If you mean just Sangla town then you can roam around on foot even. It is a tiny town. If you however mean to visit Chitkul then for that you will have to rely on either bus or shared taxi. No cycles available here on rent. Hey.. I’m planning to visit Sangla solo next week. Can I find even cheaper accommodation than you mentioned? Dorms or something? You won’t find anything lesser than Rs. 600 to Rs. 800 per day. Same as I explained above for Sangla. Rakcham is on the way to Sangla. Karcham to Sangla distance is 20 kms. I would recommend you to try short hikes starting from Sangla like Sangla kanda hike Sangla – Kamru – Kamru Kanda hike.